ww2dbaseAt the end of Oct 1940, Italy launched an unsuccessful campaign against Greece. From Albania, the Italian army marched in proudly, but within a week General Alexandros Papagos' Greek army routed the Italian invaders. Papagos counterattacked and drove the Italians back to the port of Velona by mid Jan 1941, supported by British Royal Air Force aircraft. From poor equipment and poor training, the Italian forces buckled; morale was nearly non-existent. Although Adolf Hitler had no plan to assist the Italian troops in the region, a German-controlled Balkans would prove to provide security to the Romanian oil fields at Ploesti (Romania joined the Axis in November 1940, giving Hitler the only source of oil under his direct control), and would reduce the threat of an attack from the rear on the Russian front when Operation Barbarossa launched. ww2dbaseWinston Churchill started negotiating with the Greeks in Feb 1941, hoping to persuade the fighters who resisted the Italian invasion to join the Allies. Ever since WW1, Churchill had wished for a British-aligned Balkans. However, Greek leader Ioannis Metaxas feared that an alliance with Britain would only lead to a full scale invasion by the Germans. Metaxas' successor General Alexandros Papagos, however, saw the German threat as something imminent regardless of Greece's position, and agreed to the partnership with the British. Seeing successes in Libya against the Italians, British efforts were redirected from the North African theater to the Balkans region. ww2dbaseOn 1 Mar, Bulgaria joined the Axis, followed by Yugoslavia on 25 Mar. On 27 Mar, however, Yugoslavian regent Prince Pavle was overthrown in a coup d'état led by General Dusan Simovic, leading to Berlin's decision for a full-scale invasion. On 6 Apr, Operation Marita was launched to invade Yugoslavia and Greece. Field Marshal Wilhelm List had seven armor divisions and over 1,000 aircraft at his disposal for the operation, with troops of German, Italian, and Hungarian nationalities. List encircled Yugoslavia from the east, then pour into Yugoslavian borders in a southeasterly direction toward the capital of Belgrade. Miklós Horthy, leader of the Hungarians, actually felt rather reluctant to send in his troops to participate in the attack on Yugoslavia. Amidst the spring cultivation season, Horthy did not wish to deprive his peasants the horses and men required for agricultural work, therefore he only committed to Berlin a partial mobilization. After merely a week of fighting, Belgrade fell on 13 Apr after a heavy bombardment, leading to the disintegration of the Yugoslavian government four days later. The million-strong Yugoslavian army dissipated without a central command; by this point, List had only lost 151 men. Italy, Hungary, and Germany all carved spheres of influence in the region. Germany established a puppet government in Serbia; Croatia and Slovenia claimed independence, but Germany maintained influence on their national policies. ww2dbaseThe invasion into Greece started as soon as Yugoslavia fell. By focusing an attack at the Monastir Gap, the German troops outflanked the Greeks at Thrace, and then marched south to defeat the freshly landed New Zealand Commonwealth troops under the command of Lieutenant General Maitland Wilson. The order to withdraw British forces from Greece came down on 21 Apr, and it was carried out between 24 and 29 Apr 1941. The retreat was so rushed that valuable heavy equipment were left behind for German capture. Greece fell soon after. ww2dbaseWith the Greek mainland secured, Berlin eyed Crete, a base for Greek and British forces in the region, particularly important for its air bases. The German plans called for the use of paratroopers to secure the Maleme airfield in western Crete, and then transport aircraft would bring in heavy equipment and reinforcements. With the Enigma code broken, however, the Allies knew what was to be expected, and were able to prepare the defenses accordingly. Additionally, German intelligence failed to realize the size of the Allied garrison on the island, mistaking it to be a garrison of 5,000 men when it was closer to 40,000.
ww2dbaseGerman General Kurt Student's XI Fliegerkorps paratroopers were deployed under the code name Operation Merkur (Mercury) on 20 May 1941. He made use of 750 glider troops, 10,000 paratroopers, and 7,000 troops landing from invasion beaches. The first debacle took place in the very beginning, when it was decided that the paratroopers' weapons were to be paradropped in separate crates. As it was easy for crates to be dropped a long distance from the landing zone, many German paratroopers landed with nothing more than a pistol and a knife. ww2dbaseCrete defenses were under the command of Lieutenant General Bernard Freyberg of New Zealand, whose troops took advantage of German miscalculations. His riflemen inflicted many of the German paratroopers, while the mortar teams displayed their preparation by accurately sending mortar shells to glider landing sites, destroying several gliders before the German troops were even able to get out after landing. When the Germans began the second wave of attacks which included more paratroopers and the amphibious assault, the civilian population joined in on the defense. There was one report of an older Cretan man who surprised a German paratrooper from the back with his walking cane, and eventually beat him to death. While this story might be hearsay, there was little doubt that the civilian population of Crete greatly bolstered the defense. ww2dbaseAt Malame airfield, the German paratroopers continued to fight, albeit unsuccessfully, to secure the airfield. As they were beginning to be demoralized and about to admit defeat, the New Zealand troops based there suffered communications breakdowns and began to withdraw in confusion. The German 5th Mountain Division already in the air nearby quickly took the opportunity to land, starting a steady stream of reinforcements that eventually turned the tide of the battle. The Allied forces retreated from Crete between 28 May and 1 Jun. ww2dbaseAt the end of the Battle of Crete, both sides incurred heavy losses. The British and Commonwealth casualties mounted to 18,000; 2,000 of which were of the Royal Navy, which lost three cruisers and six destroyers to the German Luftwaffe during the assault. The Germans officially suffered 6,453 casualties, though British intelligence estimated the number should be upwards of 16,800.
ww2dbaseAdolf Hitler considered the eventual victory at Crete completely out of luck, and forbade further major airborne operations; though it achieved some element of surprise on the enemy, he reasoned, airborne operations were too costly on human lives. This decision of Hitler's spelled some relief for Malta as Hitler's original plans for Malta was by means of airborne infantry. After Crete, German paratroopers were slowly reorganized into regular infantry units. ww2dbaseThe large scale British withdraw from the Balkans placed heavy demands on the Mediterranean Fleet, and the risks the fleet had taken placed a toll on its ships: two battleships damaged, one aircraft carrier sunk, three cruisers sunk and five damaged, and six destroyers sunk and seven damaged. However, the sacrifices by the British Royal Navy resulted in the rescue of 18,000 British and Commonwealth servicemen from the region. ww2dbaseSources: Armchair Reader World War II, In the Service of the Reich, the Second World War. 22 Oct 1940 Benito Mussolini set the date of the invasion of Greece to 28 Oct 1940. He had decided to attack Greece without informing Germany, as Germany had a history of starting wars without sharing advance information with Italy. 26 Oct 1940 Italy lodged a protest against Greece, citing its anti-Italian attitude. 27 Oct 1940 Late in the evening, Italian ambassador in Athens Emanuele Grazzi issued an ultimatum, demanding that Italian troops be allowed occupy strategic positions in Greece. 28 Oct 1940 At the Axis leaders' meeting in Florence, Italy, Adolf Hitler told Benito Mussolini that "Germany could make available a division of airborne troops and a division of parachute troops" should he wish to invade Crete, Greece. 28 Oct 1940 Greek leader Ioannis Metaxas rejected the Italian ultimatum; realizing the Italians were already preparing for an invasion, he noted "Alors, c'est la guerre" ("Then, it's war"). 85,000 Italian troops crossed the border from Albania, outnumbering the 30,000-strong Greek Army. 28 Oct 1940 Prime Minister Winston Churchill of Britain pledged support for Greece against the Italian invasion. 29 Oct 1940 The first British troops arrived at Suda Bay, Crete in Greece; meanwhile, a fleet of 4 battleships, 2 carriers, and 19 destroyers departed from the British naval base at Alexandria, Egypt for Crete. To the north, the Italian invasion advanced slowly. 31 Oct 1940 As the Italian invasion of Greece began to slow to a stop in the Epirus Mountains, British forces landed on the islands of Lemnos and Crete in southern Greece to prevent Italian landings on Greek islands. Greek destroyers Spetsai and Psara departed the Gulf of Patras and used their 120-mm guns to bombard Italian troops on the Ionian coast of Albania and northern Greece. 1 Nov 1940 11,000 Italian mountain troops marched for the pass at Metsovo, Greece but were trapped by 2,000 Greek troops, who knew the terrain far better than the Italians, in the Vovousa Valley 5 miles before they reached the pass. In southern Greece, British destroyers Ajax landed more troops at Suda Bay, Crete while under attack by Italian bombers. Meanwhile, Turkey declared neutrality in the Italo-Greek war. 2 Nov 1940 Turkey moved 37 divisions to the Bulgarian border and warned Bulgaria not to participate in the Italo-Greek war. Meanwhile, Italian troops reached the main Greek defensive line on the Kalamas River between Elia and Kalamas. Off Suda Bay, Crete, as British warships departed after unloading troops, Italian bombers scored near misses against them but failed to cause damage. 3 Nov 1940 In the Pindus Mountains in northern Greece, Greek Pindus detachment counterattacked against Italian Julia Division, recapturing the villages of Samarina and Vovousa. Further west, Italian tanks were brought up to attack the Greek defenses on the Kalamas River, but the terrain was poorly suited for mobile operations. Far to the south, British troops began arriving on mainland Greece. 4 Nov 1940 The Italian Julia Division continued to be trapped in the Vovousa valley in northern Greece, incurring heavy casualties as Greek troops mounted repeated attacks in an attempt to eliminate this pocket. Further west, Italian troops established a bridgehead across the Kalamas River, but failed at their first attempt to break out. 5 Nov 1940 Greek cavalry troops under General Georgios Stanotas began a new attack on the enveloped Italian Julia Division in the Vovousa valley in northern Greece. 6 Nov 1940 The Greek 2nd Army Corps mounted another attack on the enveloped Italian Julia Division in the Pindus Mountains region in northern Greece. To the west, Italian forces at the Kalamas River continued their attempt to break out of the bridgehead. 8 Nov 1940 After failing to expand from the Kalamas River bridgehead in western Greece, Italian troops in that region began to pull back. In the Pindus Mountains in northern Greece, the enveloped Italian Julia Division also began to attempt to break out for a retreat. 9 Nov 1940 Sebastiano Visconti Prasca was relieved as commander of Italian operations in Greece for the failures to breakthrough Greek defense lines in northern Greece. He was replaced by General Ubaldo Soddu. 10 Nov 1940 In northern Greece, Greek troops continued to push Italian troops back toward the Albanian border both in the coastal region as well as in the Pindus Mountains. 12 Nov 1940 Adolf Hitler issued a directive to the German army to be prepared in invade Greece so that the Luftwaffe could attack airfield from which the RAF might attack the oilfields of Romania. 13 Nov 1940 By the end of the day, Greek troops had pushed most Italian troops in northern Greece back to the Albanian border. 14 Nov 1940 As Greek troops began to cross into Albanian borders, the Axis suffered its first land defeat of the war. 15 Nov 1940 A convoy of 5 transports, escorted by British warships, departed from Alexandra, Egypt for Pireaus, Greece, carrying 4,230 troops, 700 trucks, gasoline, and other supplies. 16 Nov 1940 The Greek 3rd Army Corps broke through the Italian 9th Army defensive line at Korcë, Albania. Far to the south, 4,230 British troops arrived at Pireaus, Greece by sea. 17 Nov 1940 Greek 3rd Army Corps engaged in heavy fighting with Italian 9th Army near Korcë, Albania. 18 Nov 1940 British cruiser HMS York departed Port Said, Egypt with a battalion of troops for Suda Bay, Crete, Greece, and anti-aircraft guns for Piraeus, Greece. 19 Nov 1940 Italian troops were driven across the Kalamas River in northwestern Greece by Greek troops. To the south, British cruiser HMS York arrived at Suda Bay, Crete, Greece and disembarked a battalion of troops. 20 Nov 1940 British cruiser HMS York delivered anti-aircraft guns to Piraeus, Greece and returned to Alexandria, Egypt. 21 Nov 1940 Greek troops defeated the Italian IX Army and captured Koritza, Albania. The Greeks took 2,000 prisoners and captured 135 field guns and 600 machine guns. The surviving elements of the Italian IX Army was able to escape without being harassed as the Greeks were poorly motorized and could not give chase. 22 Nov 1940 Italian 9th Army was defeated in Greece. 28 Nov 1940 Italian destroyers Pigafetta, Da Recco, Pessagno, and Riboty bombarded Greek positions on the island of Corfu. 3 Dec 1940 Greek troops pushed Italian troops back 15 miles, capturing Sarandë, Albania. To the far south, Italian torpedo bombers attacked the British naval base at Suda Bay, Crete, Greece at 1540 hours, damaging British cruiser HMS Glasgow with two torpedoes (3 killed, 3 wounded). 4 Dec 1940 Greek forces captured Përmet (capturing 500 Italians), Pogradec, and Sarande in Albania. 6 Dec 1940 Santi Quaranta, Albania was taken by Greek forces. 8 Dec 1940 Greek troops captured Gjirokastra and Delvinë in Albania. 13 Dec 1940 Führer Directive 20 was issued to prepare for Operation Marita, the invasion of Greece. 18 Dec 1940 Italian cruisers Eugenio and Montecuccoli and destroyers Pigafetta, Da Recco, Pessagno, and Riboty shelled Greek forces on the Albanian coast near Corfu. 19 Dec 1940 British battleships HMS Valiant and HMS Warspite shelled Italian defensive positions at Vlorë, Albania overnight in support of Greek advances. 22 Dec 1940 Himarë, Albania was captured by the Greek army. 23 Dec 1940 In Albania, Greek forces pushed back Italian troops another 20 miles up the Ionian coast. 28 Dec 1940 Mussolini requested German aid against the Greeks in Albania. 1 Jan 1941 Negotiations began between Germany and Bulgaria to use Bulgarian territory as a staging area for Operation Marita, the German invasion of Greece. 3 Jan 1941 The Italians launched a counter-offensive to the north and west of Korcë, Albania; two fresh Italian divisions were committed to the Klissoura sector on the Vlorë road to regain the initiative. 6 Jan 1941 Overnight, Greek destroyers shelled the Albanian port of Vlorë. 20 miles south, Italian destroyers Alfieri, Carducci, Fulmine, and Gioberti, and torpedo boats Partenope, Pallade, Romeda, and Altair shelled Greek positions at Porto Palmermo. The Greek offensive against Italian positions in the mountains of Albania reached the strategically important Klisura Pass on the river Vjosë, which, if captured, would allow Greek forces in the center of the front to link up with troops on the coast, but it was met with stiff resistance. 9 Jan 1941 Italian destroyers Ascari, Carabiniere, Folgore, and Fulmine shelled Greek positions on the Albanian coast at Porto Palmermo. 10 Jan 1941 Greek troops, with the recently arrived Greek 5th Cretan Division, captured Klisura Pass in Albania after 4 days of fighting. 11 Jan 1941 Italian 7th Infantry Division Lupi di Toscana and the remnants of Italian 3rd Alpine Division Julia launched a failed counterattack on Klisura Pass in Albania, which was captured by the Greeks on the previous day. 14 Jan 1941 British Commander-in-Chief Middle East General Wavell met Greek Prime Minister Ioannis Metaxas and Greek Commander-in-Chief General Alexandros Papagos in Athens, Greece. Papagos asked Wavell for 9 divisions of British troops plus air support, but Wavell only offered 2 or 3 divisions. Papagos, who thought 2 to 3 divisions was too few to effectively deter a German invasion while still putting Greece in an indebted position, rejected the offer. 19 Jan 1941 Benito Mussolini visited Adolf Hitler at Berchtesgaden in Germany, accepting German assistance in North Africa, but not Albania. Hitler noted that he would launch an invasion of Greece if British troops there began to threaten the oil refineries at Ploiesti, Romania. 8 Feb 1941 Bulgaria agreed to allow German troops to transit within its borders. 12 Feb 1941 British Foreign Secretary and Chief of Imperial General Staff left London, England, United Kingdom for Cairo, Egypt to coordinate military assistance to Greece. They were also trying to create an anti-Axis agreement, which would soon be rebuffed by Yugoslavia and Turkey. 17 Feb 1941 Turkey and Bulgaria signed a friendship agreement in Sofia, Bulgaria. Under pressure from Germany, Turkey also agreed to not protest German troop movements through Bulgaria. 19 Feb 1941 British Foreign Secretary Anthony Eden, Chief of the General Staff John Dill, Commander-in-Chief Middle East General Archibald Wavell, and Mediterranean Fleet chief Admiral Andrew Cunningham met in Cairo, Egypt to discuss diverting forces from North Africa to aid Greece. 22 Feb 1941 Greek King George II and Commander-in-Chief General Alexander Papagos met with British Foreign Secretary Anthony Eden and General Archibald Wavell in Athens, Greece, designing a defense plan that assumed Yugoslavia would remain neutral. 23 Feb 1941 Prime Minister Alexandros Korizis of Greece accepted British offer of aid, but British and Greek commanders debated on the defense strategy against a German invasion through Bulgaria. The Greeks preferred to dig in along the Metaxas Line, while the British argued for a line further southwest along the Vermion Mountains and the Haliacmon River. 28 Feb 1941 British destroyers HMS Decoy and HMS Hereward land 200 more British troops on the Greek island of Kastelorizo in the Dodecanese Islands to reinforce Operation Abstention; as the Italians reinforced the two torpedo boats in the area, Lupo and Lince, with destroyer Crispi, destroyer Sella, and two more torpedo boats, the British decided to cancel Operation Abstention; 40 British commandos were left behind and captured in the hastened retreat. To the north, German troops began to across into Bulgaria. Meanwhile, one squadron of RAF Hurricane fighters and one squadron of RAF Gladiator biplane fighters shot down 27 Italian aircraft over the Albanian mountains in support of Greek troops on the ground. 2 Mar 1941 German Twelfth Army moved from Romania into Bulgaria the day after Bulgaria joined the Axis alliance. 3 Mar 1941 Italian aircraft bombed Larissa, Greece; 5 bombers were shot down by RAF Hurricane fighters. 4 Mar 1941 Four British freighters departed Alexandria and Port Said, Egypt with men and equipment, escorted by destroyers HMS Hereward and HMS Stuart, for Greece; it was codenamed Operation Lustre. Meanwhile, British General Wilson arrived in Athens, Greece to take command of all Allied ground forces; he discovered the Greek troops were still manning the Metaxas Line on the Bulgarian-Greek border rather than the agreed upon Aliakmon Line. From the sea, Italian warships bombarded Greek coastal positions in Albania. 5 Mar 1941 British reinforcement from North Africa arrived in Greece. On the same day, the British government broke off diplomatic relations with Bulgaria in response to their alliance with Germany. 6 Mar 1941 Two British convoys departed from Alexandria, Egypt for Greece; the first convoy, consisted of British cruisers HMS York, HMS Bonaventure, and HMS Gloucester departed with troops to reinforce Greece; the second, consisted of freighters Clan Macauley and Cingalese escorted by destroyers, departed with tanks and equipment. At 0715 hours, an empty convoy returning from Greece to Egypt was attacked by Italian submarine Anfitrite east of Crete; Anfitrite was counterattacked and forced to the surface and was scuttled by her own crew. 7 Mar 1941 British cruisers HMS York, HMS Bonaventure, and HMS Gloucester arrived at Piraeus, Greece, disembarking troops from North Africa. 7 Mar 1941 Field Marshal Jan Smuts arrived in Cairo, Egypt where, at an evening conference, he gave his support to Anthony Eden's firm line to commit troops to the Greek mainland. 9 Mar 1941 Benito Mussolini visited Tiranë, Albania; he announced on radio that he would personally lead a renewed offensive against Greece. On queue, 12 Italian divisions attacked Greek lines through the Trebeshinë heights between Osum and Vjosë Rivers, but the Greek First Army was generally able to hold the lines. 14 Mar 1941 Seeing the Greeks had repeated repulsed Italian attacks in the past few days, Italian Chief of the Supreme Command General Ugo Cavallero recommended Benito Mussolini to halt the Primavera Offensive. On the same day, 5 British Swordfish torpedo bombers from Paramythia, Greece struck Vlorë, Albania, sinking Italian hospital ship Po and ship Santa Maria at the loss of one aircraft. 16 Mar 1941 The Italian Primavera Offensive was called off after 8 days after the Italians had suffered 12,000 casualties. 18 Mar 1941 British bombers attacked Vlorë, Albania, sinking Italian torpedo boat Aldebaran. 26 Mar 1941 Six Italian explosive motor boats crippled Norwegian tanker Pericles and British cruiser HMS York (killing 2) in Suda Bay, Crete, Greece at 0446 hours; all six Italian boat drivers survived the attack, but all were captured. 27 Mar 1941 General Dusan Simovic and other anti-German officers overthrew the pro-Axis government in Yugoslavia, placing Regent Prince Paul with King Petar II and intending to back out of the Tripartite Pact. Upon hear the news, Adolf Hitler ordered an invasion of Yugoslavia; the German foreign ministry prepared messages to Hungary, Bulgaria, and Italy for them to join in the partition Yugoslavia. On the same day, 500 German military aircraft were dispatched for Bulgaria and Romania. 3 Apr 1941 German bombers sank British munitions ship Northern Prince 17 miles west of Crete, Greece. All crew members survived. 4 Apr 1941 Italian bombers sank Greek torpedo boat Proussa and Greek freighter Sussanna off Corfu, Greece. 6 Apr 1941 Before dawn, German, Hungarian, and Italian forces invaded Yugoslavia from Austria, Romania, Bulgaria, and Albania. German Luftwaffe swiftly destroyed Yugoslavian Air Force on the ground and devastated Belgrade with aerial bombing between 0700 and 0830 hours, killing 4,000 civilians; on the ground, German forces spearheaded by armor reached the Skopje and Veles areas in southern Yugoslavia. On the same day, German, Hungarian, and Italian forces invaded Greece from Bulgaria. Unlike the success in Yugoslavia, the invasion was slowed by Greek and British troops at the Metaxas Line. After sundown, a Luftwaffe raid on Piraeus, Greece got an unexpected boost when the ammunition ship Clan Fraser was hit, with the resulting blast doing more damage to the port facilities than the aerial bombs dropped by the Germans; the explosion also caused the sinking of 11 other freighters. 7 Apr 1941 Yugoslavian troops were forced to withdraw to southern Macedonia when the Germans captured Skopje, exposing their flank. German 2nd Panzer Division had reached Strumica, Yugoslavia by the end of the day, which was only 10 miles from the Greek border, from which point it would be able to bypass the Metaxas Line defenses, where German troops conducted a failed frontal assault on this day. The United Kingdom promised aid to Yugoslavia and broke off relations with Hungary; meanwhile, RAF bombers conducted a raid on Sofia, Bulgaria. 8 Apr 1941 German 2nd Panzer Division crossed from southern Yugoslavia into northern Greece near Dojran Lake. Elsewhere, German 73rd Infantry Division moved into the Monastir Valley and captured Prilep, Yugoslavia and prepared to move south toward Salonika, Greece. German 6th Mountain Division penetrated the Metaxas Line by crossing a 7,000 feet mountain range. Finally, German bombers attacked Belgrade, Yugoslavia. 9 Apr 1941 German troops reached the Monastir Gap in Macedonia, southern Yugoslavia, preparing to cross into Greece to outflank the Metaxas Line and the Aliakmon Line. German troops also arrived at Nis, Yugoslavia and Salonika, Greece on this day. 10 Apr 1941 In Yugoslavia, German troops capture the Croatian capital of Zagreb; Croatian Fascist chief Ante Pavelic returned from exile to proclaim the independent state of Croatia. Further South, German 9th Panzer Division and Leibstandarte SS Adolf Hitler Regiment moved through the Monastir Gap, moved across the Greek border, and captured the town of Florina. British troops fell back from the Aliakmon Line southwest of Salonika, Greece. 11 Apr 1941 Italy and Hungary joined the German invasion of Yugoslavia. 12 Apr 1941 German troops captured Belgrade in the Serbia region of Yugoslavia as Hugarian troops also crossed the border into Yugoslavia, joining the invasion. On the Danube River in Yugoslavia, German Ju 87 Stuka dive bombers, sinking river monitor Drava (54 were killed, 13 survived) while forcing three others, Morava, Sava, and Vardar, to be scuttled. To the south in Greece, German SS troops overran British and Australian troops south of Vevi, forcing the Allies to fall back from the Aliakmon Line to the Mount Olympus Line to block the German troops at Vevi from advancing further. On the same day, British anti-aircraft cruiser HMS Coventry, destroyer HMS Decoy, destroyer HMS Encounter, and troopship Glenroy evacuated a battalion of troops, 1,000 tons of supplies, and 40 vehicles from the Greek island of Lesbos in the Aegean Sea near Salonika. 13 Apr 1941 The German Leibstandarte SS Regiment attacked through the Metsovon Pass in an attempt to flank the Greek positions on the front with Albania. To prevent this, Greek General Papago ordered Greek troops in Albania to fall back, allowing Italian 11th Army to capture Korçë, Permet, and Porto Palermo in Albania. Further south, German aircraft attacked Piraeus, Greece, sinking Greek destroyer Psara and damaging destroyer Vasilevs Georgios I. 14 Apr 1941 The Greek Epirus Army continued to withdraw from Albania, and German 73rd Infantry Division attempted to block it at Kastoria Pass, resulting in heavy fighting. On the eastern coast of Greece, the German advance was halted at Platamon between Mount Olympus and the Aegean Sea. King Petar II of Yugoslavia fled to Athens, Greece as German troops advanced on his capital; in the evening, the Yugoslavian government asked General Ewald von Kleist of the German 1st Panzer Group for a ceasefire. 15 Apr 1941 Yugoslavian 2nd Army surrendered Sarajevo to the Germans, effectively ending the country's official resistance; many fighters, however, fled into the mountains and would later fight as guerrillas. 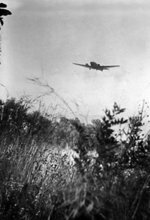 In Greece, German aircraft bombed the British RAF airfield at Larisa at dawn, destroying 10 Blenheim aircraft on the ground. Troops of Leibstandarte SS Regiment took the road to Greneva, isolating the Greek Epirus Army which was attempting to move from Albania back into Greece. This move also exposed the flank of the Allied Mount Olympus Line; in response, British General Wilson ordered the Mount Olympus Line abandoned at 1000 hours, with Australian and New Zealand troops acting as rear guards for several more days as the remaining Allies fell back to the Thermopylae Line. As the situation grew dire, British Admiral Cunningham begins began considering a general evacuation from Greece. 16 Apr 1941 Yugoslavians negotiated with the Germans for armistice terms in Belgrade, but the first emissary dispatched did not have sufficient authority to sign the surrender document. In Zagreb, Croatian leader Ante Pavelic formally came into power as the head of the Independent State of Croatia. In Greece, German troops attacked the Platamon Pass between Mount Olympus and the Aegean Sea, forcing New Zealand troops to withdraw across the river at the bottom of the Tempe Gorge, a move that greatly alarmed Allied leadership. Meanwhile, German 6th Mountain Division attacked across Mount Olympus using goat paths, taking heavy casualties. 17 Apr 1941 Yugoslavia formally surrendered to Germany as Foreign Minister Cincar-Marcovic signed the armistice with German and Italian representatives in Belgrade. Germans captured Yugoslavian destroyers Beograd and Dubrovnik at Kotor, but destroyer Zagreb was scuttled by her crew (2 killed in the process). In Greece, New Zealand 21st battalion reinforced by Australian 2/2nd Battalion demolished the Pinios River railway bridge and held the Tempe and Pinios Gorges, delaying the German advance down the Aegean coast, allowing other Allied troops to withdraw to new defenses on the Thermopylae line. British Prime Minister Churchill agreed to the proposal for the evacuation of Allied troops from mainland Greece to the island of Crete, should it become necessary; this plan was then communicated to the government of Greece shortly after. 18 Apr 1941 German 3rd Regiment and 2nd Panzer Division crossed the Pinios River in Greece while German 6th Mountain Division reached Mount Olympus in Greece, putting the Australian and New Zealand troops at the Pinios Gorge in danger. As German troops continued to move south in Greece, Prime Minister Alexandros Koryzis committed suicide in the evening; in response to this suicide, Athens was placed under martial law by the government to maintain stability. 19 Apr 1941 German troops captured Larisa, Greece, theoretically allowing them to move south along the eastern coast of Greece, thus this movement was to be hampered by roads and bridges that were destroyed by retreating Allied troops. Elsewhere, troops of German Leibstandarte SS Adolf Hitler Regiment captured Ioannina 50 miles from the western coast of Greece, further frustrating the southward retreat of Greek Epirus Army from Albania. British General Wavell flew to Athens, Greece for a meeting with King George II where the king agreed that the Allies could not hold Greece, and preparations should begin immediately to evacuate troops to Crete to prevent further destruction of the country. General Wilson was ordered to prepare for a stand at Thermopylae with a small rearguard force to protect the southward evacuation of British troops. 20 Apr 1941 Athens, Greece was heavily bombed by German dive bombers; one of seven RAF Hurricane aircraft lost in beating off the raid was flown by Squadron Leader Marmaduke "Pat" Pattle, believed to be the Allies' top scoring fighter pilot of the war with at least 50 kills (that number could not be officially recognised as his record of service in Greece was lost); Pattle died trying to protect a fellow pilot. Piraeus, Greece was also attacked from the air, sinking Greek destroyer Psara with 37 killed; 22 German aircraft were lost while the British lost 10 Hurricane fighters. Unable to withstand the German advances, British forces withdrew from Mount Olympus toward Thermopylae on the same day that King George II led a new government. To the north in Albania, General Tsolakoglou surrendered the Greek Epirus Army, without authorization, to the German Leibstandarte SS Adolf Hitler Regiment; Italian leader Mussolini protested, requesting that the surrender must be accepted by an Italian general. 21 Apr 1941 Georgios Tsolakoglou signed the surrender of the entire Greek Army to Germany. 21 Apr 1941 German air and ground forces attacked British, Australian, and New Zealand troops at Thermopylae, Greece; dive bombers sank Greek torpedo boat Thyella, hospital ship Ellenis, hospital ship Esperos, and several freighters. 22 Apr 1941 German aircraft attacked British-controlled airfields near Athens, Greece, forcing remaining British fighters in the region to be withdrawn to Argos in southern Greece. In the Saronic Gulf, German dive bombers sank Greek minelayer Aliakmon, hospital ship Sokratis, 11 freighters, and 1 tanker. At 1800 hours, 35 German dive bombers sank Greek destroyer Hydra at Piraeus; 41 were killed, 115 survived. Further south, German aircraft damaged cruiser HMS York at Suda Bay, Crete with near misses. Finally, on the same day, Yugoslavian torpedo boats Kajmakcalan and Durmitor arrived at Suda Bay and joined the Allied fleet. 23 Apr 1941 German troops attacked westward in Greece from Ioannina. Meanwhile, German paratroopers landed on Aegean Islands. On the same day, German bombers destroyed 13 British Hurricane fighters on the ground at Argoes (forcing the survivors to evacuate to Crete) and sank Greek torpedo boat Kios, minelayer Nestos, hospital ship Policos, battleship Kilkis, battleship Lemnos, 12 freighters, and 1 tanker; damaged Greek torpedo boat Doris was scuttled to prevent capture. King George II of Greece, Crown Prince Paul, Prime Minister Emmanuel Tsouderos and other important figures of the Greek government were evacuated by the RAF to Crete, where an attempt to evacuate personnel from Crete to Egypt had begun; King George II instructed that his wine cellar should be distributed to the Allied troops who fought to defend his country. 24 Apr 1941 German paratroopers captured the Corinth Canal in Greece. Meanwhile, German aircraft sank hospital ship Andros and 11 freighters off the coast and damaged British cruiser HMS York and submarine HMS Rover at Suda Bay, Crete; Greek torpedo boats Aigli, Alkyoni, and Arethousa were scuttled to prevent capture. British troops held off German attacks through the afternoon at Thermopylae, destroying 15 German tanks, before withdrawing after sundown. At 1900 hours, Greek luxury yacht Hellas was bombed at Piraeus while boarding 500 British civilians and 400 wounded Allied soldiers, killing 500. 25 Apr 1941 Allied rearguard forces from Thermopylae, Greece traveled 100 miles within 12 hours and reached the Greek capital of Athens around noon time; while crowds welcomed their arrival, diplomats of various countries burned papers as Axis capture was imminent. Just to the south, British troopship Pennland was damaged by German aircraft while attempting to evacuate troops, resulting in 4 deaths; other ships were able to evacuate 5,500 Allied personnel on this day. Out at sea, German aircraft sank 6 merchant ships and 1 yacht; 6 Greek destroyers and 5 submarines were able to escape toward Alexandria, Egypt. Finally, on this date, Hitler issued Führer Directive 28 for the attack on Crete, Greece, which was to be codenamed Operation Merkur. 25 Apr 1941 An indication that the Germans were considering Crete, Greece as a target for major parachute assault was discovered by the code-breakers at the Government Code and Cypher School at Bletchley Park in Britain through an interception of the German Luftwaffe's lax cypher discipline. 26 Apr 1941 German paratroopers attacked the Corinth Canal bridge in Greece early in the morning; the bridge was blown up as the German approached; by the end of the day, however, German engineers would erect temporary crossings at this point of the canal. Overnight, 8,300 Allied troops were evacuated from beaches south of Athens while 12,950 were evacuated from beaches on the Peloponnese Peninsula. German aircraft sank Greek torpedo boat Kydonia and 3 other ships on this date. To the north in Yugoslavia, British destroyer HMS Defender evacuated the crown jewels of Yugoslavia. 27 Apr 1941 At 0400 hours, Dutch passenger liner Slamat departed Nauplia in southern Greece with 211 crew and 500 evacuating Allied troops; Slamat and escorting destroyers HMS Diamond and HMS Wryneck were all sunk by German Stuka dive bombers at 0700 hours, killing about 900. Later in the same morning, German 2nd Panzer Division captured Athens, raising the Nazi German flag above the Acropolis as a sign of victory and capturing large quantities of fuel, ammunition, and heavy vehicles; surrendered Greek officers were allowed to retire to their homes with their sidearms without being interned as prisoners of war. German 5th Panzer Division moved across the Corinth Canal all day and Leibstandarte SS Adolf Hitler Regiment crossed onto the Peloponnese Peninsula in southern Greece at Patras at 1730 hours. 4,200 Allied troops were evacuated from beaches south of Athens. 28 Apr 1941 German aircraft sank Greek torpedo boat Kyzikos and 2 other ships during the day. 2 companies of the German 5th Panzer Division captured the port of Kalamata, Greece, disrupting evacuation of Allied troops; though Allied forces would recapture the port by the end of the day, all British ships had already departed from Kalamata. Overnight, 4,170 Allied troops were evacuated from the Peloponnese Peninsula in southern Greece. 29 Apr 1941 Allied resistance on mainland Greece ended at 0530 hours when 8,000 British, New Zealand, Australian, Greek, and Yugoslavian troops surrendered at Kalamata, Greece. On the same day, British intelligence picked up positive information about the German invasion of Crete; in response, most British troopships at Suda Bay in Crete were dispatched to Alexandria, Egypt to prevent being attacked by German aircraft. 30 Apr 1941 New Zealand General Bernard Freyberg was appointed commander of Allied forces on Crete, Greece, commanding a garrison of poorly-armed 29,000 British, Australian, and New Zealand troops and 9,000 Greek troops. 6 May 1941 General Bernard Freyberg received intelligence that the Germans were likely to launch a large airborne assault on Crete, Greece on 17 May; he would continue to expect the invasion to come from the beaches rather than the sky, however. 11 May 1941 German forces completed the occupation of the Greek islands in the Aegean Sea. 14 May 1941 British cruiser HMS Dido departed Suda Bay, Crete, Greece and headed for Alexandria, Egypt with £7,000,000 worth of Greek gold aboard. She was escorted by destroyers HMS Stuart, HMS Vendetta, HMS Janus, and HMS Isis. 15 May 1941 At midnight, British cruisers HMS Gloucester and HMS Fiji completed the transfer of the 2nd Battalion Leicester Regiment from Alexandria, Egypt to Heraklion, Crete, Greece. During the day, German Luftwaffe aircraft attacked Salamis Navy Yard at Suda Bay, Crete, sinking Greek destroyer Leon. 16 May 1941 The final British reinforcements arrived on Crete, Greece. On the same day, German aircraft bombed various British positions on Crete (including airfields) as well as the shipping in Suda Bay (sinking several freighters and damaging HMS York). 18 May 1941 German dive bombers attacked British hospital ship Aba 50 miles south of Crete, Greece. Petty Officer Alfred Sephton of British light cruiser HMS Coventry won the Victoria Cross for directing anti-aircraft fire against the German aircraft despite being partially blinded by a machine gun bullet; he would die from his injuries on the next day. In anticipation of a German invasion of Crete, Greece, 700 Argyle and Sutherland Highlanders were transported from Port Said, Egypt, on troopship Glengyle; they would land at Tymbaki, Crete after sundown. 19 May 1941 German aircraft attacked British airfields on Crete, Greece. To prevent destruction, the British RAF evacuated all aircraft from Crete to Egypt. 20 May 1941 German invasion of Crete, Greece began with an airborne assault at 0800 hours, capturing Maleme airfield on the northern coast. At 1615 hours and 1730 hours, the second airborne assault was conducted at Rethimnon and Heraklion, respectively; 1,856 German airborne troopers were killed during the second attack wave. At Suda Bay, Crete, German bombers sank British minesweeper HMS Widnes. After sundown, British destroyers HMS Jervis, HMS Nizam, and HMS Ilex bombarded the German-controlled airfield on the Greek island of Karpathos. 21 May 1941 In the early hours of the day, 3 British cruisers and 4 destroyers intercepted and sank 11 small Axis vessels, killing 297 Germans. In the morning, 650 men of the German 5. Gebirsgäger Division landed on Crete, Greece in time to support the paratroopers already in position against a British counter attack at Maleme airfield. Many of the transport aircraft that delivered the troops would be damaged or destroyed on the airfield before they could take off. New Zealand General Freyberg held back his reserves despite German presence at Maleme, believing that the main German invasion was still to come at the beaches. At the nearby island of Milos, 19 fishing boats and 2 small passenger ships disembarked 2,331 German infantry. Out at sea, German aircraft damaged HMS Dido, HMS Orion, and HMS Ajax while Italian bombers sank HMS Juno (128 killed, 97 survived). 22 May 1941 Before dawn, British warships searched for an Axis convoy off the Greek island of Milos; after sunrise, German aircraft spotted the ships, damaging HMS Naiad (6 killed), HMS Calcutta (14 killed), and HMS Kingston (1 killed) at 1000 hours. At 1200 hours, HMS Greyhound was sunk (76 killed) and HMS Warspite was damaged (43 killed). Shortly after, HMS Gloucester (722 killed) and HMS Fiji (257 killed) were also sunk. Meanwhile, at Crete, Greece, Australian and New Zealand troops counterattacked at Maleme at 0330 hours, but German 5. Gebirsgäger Division troops repulsed the attack. During the day, additional Ju 52 aircraft brought two more battalions of troops to Maleme. Australian and New Zealand troops were pulled back from Maleme to Suda Bay to protect the main supply point while regrouping for another counterattack. 23 May 1941 HMS Kelly commanded by Lord Louis Mountbatten, great grandson of Queen Victoria, was sunk 35 miles south Crete, Greece at 0800 hours, shortly a bombardment mission; 181 were killed, 297 survived. On the island itself, bitter fighting continued. During the day, German reinforcements arrived at Maleme airfield, but the attempts to land troops by sea were rebuffed. The Germans now controlled the west end of the island. On the same day, German bombing of Suda Bay sank 5 British motor torpedo boats. 24 May 1941 Allied troops began to fall back southward in Crete, Greece. German bombers attacked Chaniá on the northern coast, causing great damage. After dark, British minelayer HMS Abdiel transported 200 British commandos from Alexandria, Egypt to Suda Bay, Crete; another effort to transport 800 commandos to Port Lutro, Crete was canceled due to bad weather. 25 May 1941 After being reinforced through Maleme airfield on Crete, Greece, German Stuka dive bombers attacked Allied lines at 1600 hours, softening defenses for a ground assault toward Galatas on the northern coast. Elsewhere on the island, German aircraft bombed Heraklion. 26 May 1941 During the day, German aircraft misidentified the German column moving from Galatas, Crete, Greece toward Canea on the Suda Bay. After sundown, poor communications and conflicting orders caused 1,000 Allied troops at Canea to become surrounded. Also during the night, British minelayer HMS Abdiel and destroyers HMS Hero and HMS Nizam arrived at Suda Bay from Alexandria, Egypt and disembarked 750 British commandos under Colonel Robert Laycock; they evacuated personnel from the naval base as they departed. 27 May 1941 German troops captured Canea, Crete, Greece, thus securing the use of the anchorage at Suda Bay. 28 May 1941 The evacuation of British and Commonwealth troops from Crete, Greece began before dawn; the evacuation centered around Sphakia on the southern coast of Crete, while Colonel Laycock commanded a rearguard force to guard the evacuation. British cruisers HMS Ajax, HMS Orion, and HMS Dido and destroyers HMS Decoy, HMS Jackal, HMS Imperial, HMS Hotspur, HMS Kimberly, and HMS Hereward departed Alexandria, Egypt for Heraklion, Crete to help with the evacuation; German aircraft damaged HMS Ajax (killing 6, wounding 18, and forcing her to turn back) and HMS Imperial (wounding 1); the force, less Ajax, arrived at Heraklion at 2330 hours. 29 May 1941 A British force of cruiser and destroyers embarked 3,486 men at Heraklion, Crete and departed for Egypt at 0245 hours. At 0400 hours, HMS Imperial's steering failed; she transferred her crew and passengers, and then was scuttled by HMS Hotspur. After dawn, HMS Hereward was bombed by Italian aircraft, 76 were killed and 89 survivors were captured. Cruisers HMS Orion and HMS Dido were also attacked, killing 105 crew and 260 passengers on the former and 27 crew and 100 passengers on the latter. The force would finally arrive at Alexandria, Egypt at 2000 hours. 30 May 1941 Before dawn, a force of British cruiser and destroyers embarked 6,029 troops and departed Sphakia, Crete, Greece for Egypt. En route, they were attacked by Axis aircraft; a bomb hit on cruiser HMS Perth killed 13, but RAF fighter escorts prevented Axis aircraft from dealing the kind of damage they did on the previous day against a different evacuation convoy. Destroyer HMS Kelvin, sailing north from Egypt, was damaged by a bomb en route, killing 1. On land, German aircraft strafed evacuation beaches at and near Sphakia. 31 May 1941 British destroyers HMS Napier and HMS Nizam embarked 1,510 troops at Sphakia, Crete, Greece and departed before dawn for Egypt; they were attacked by Axis aircraft en route, causing minor damage. At 0600 hours, British cruiser HMS Phoebe, minelayer HMS Abdiel, and destroyers HMS Jackal, HMS Kimberley, and HMS Hotspur departed Alexandria, Egypt for Sphakia to evacuate more troops. On the same day, 54 senior level Allied officers, including General Freyberg, were evacuated from Crete by aircraft. 31 May 1941 In Crete, Greece, German Luftwaffe General Kurt Student issued an order authorizing reprisals against the civilian population, including women and boys, proven of involvement in fighting, committing sabotage, or mutilating or killing wounded soldiers. The reprisals were to consist of shooting, fines, burning villages or extermination of the male population. Several senior officers stormed out of the conference in protest of the order but there were a few officers who were quite prepared to lead execution squads. 1 Jun 1941 Before dawn, British cruiser HMS Phoebe, minelayer HMS Abdiel, and destroyers HMS Jackal, HMS Kimberley, and HMS Hotspur embarked 3,710 Allied troops at Sphakia, Crete, Greece and departed; the force would arrive safely at Alexandria, Egypt later on the same day. Anti-aircraft cruisers HMS Calcutta and HMS Coventry were dispatched from Alexandria to cover this force; HMS Calcutta was attacked by Axis aircraft, sinking at 0945 hours with 118 lost and 255 wounded. Although the Allied efforts had evacuated 16,511 men from Crete, 5,000 still remained; they would be surrendered by Australian Lieutenant Colonel Theo Walker by the end of the day, thus ending the German campaign on Crete. 5 Jun 1941 Germany announced that 15,000 British and Commonwealth prisoners of war were captured at Crete, Greece. 14 Jun 1941 In a letter to General Hastings Ismay, Winston Churchill critised Bernard Freyberg's tactical handling of the defence of Crete, Greece, in particular the fact that no counter-attack had been mounted in the western sector (e.g. around Maleme airfield) for 36 hours after the initial German assault. I am looking for a relative who died in WW2 he is Carmine Melideo an Italian soldier who may be buried in Germany, any ideas how I could find him?? Hitler's decision not to invade Malta probably cost him the war. The name of the leader of the coup d'etat in March 1941 was not Dragiša Simović, but Dušan Simović. Balkans Campaign; 21st November 1940 - Greek IX Army should be Italian IX Army. Nigel: Thank you very much, the mistake has been corrected!